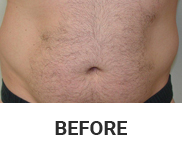 Liposuction surgically removes unwanted stubborn fat in almost any part of the body. Performed as a day operation, you can go back to work the next day. It depends on the area(s) and the amount being done. But usually it will cost between $2500 and $8000. This includes the theatre costs but not the anaesthetic fees. Some people who have very large areas, or many different areas, may need to be done in more than one operating session. When two areas that cost $4000 each are done at the same time, the cost is $6000. Yes, because we are born with a certain number of fat cells. When they are surgically removed during liposuction, they cannot be produced again. But if we overeat and don’t exercise, the remaining fat cells can expand. We will have less fat cells and less chance of putting on weight again if we eat and exercise in moderation. Liposuction is not a substitute for a good diet, but a treatment for removing bulges. Fat doesn’t weigh much and therefore we cannot talk of it in kilos. We measure fat in terms of millilitres and litres. Two and a half or even as much as three litres can be removed in a Day Liposuction Surgery safely. This is a large amount, but any more must be done in Hospital and this involves an overnight stay and is more costly. Liposuction is not a way to reduce your overall weight. It changes your shape. You can best tell how much weight you have lost by your clothes, not the scales. Which areas can be done? 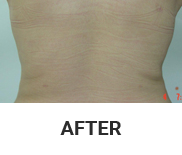 Liposuction as performed in your Sydney Cosmetic Surgery Centre is not painful to the majority of patients. You are given mild sedation which is administered by an Anaesthetist, which will be like a a twilight sleep. The area to be operated on is numbed with a local anaesthesic. You may feel some discomfort for 24 hours, but this can be reduced with medication, like panadol or panadeine. One to two hours for the entire liposuction procedure. Because of the sedation, you will need to recover here at the day surgery centre for at least four hours before being collected. Infection: Unlikely. Antibiotics are routinely prescribed prophylactically. Bleeding: This is not a major problem but it is common to have bruising in the area after surgery and liposuction. Nerve injury: All major vessels and nerves are at a deeper plane. Nevertheless, small nerve fibres under the skin can be damaged and cause temporary numbness. Superficial thromboplebitis: sometimes, if the superficial veins are damaged in liposuction, the patient will notice a palpable reddish tender cord along the course of the vein. There are risks associated with any surgery and the cosmetic surgeon will be happy to discuss this at your consultation. This is the commonest complication after liposuction and may be visible in various forms. More often these irregularities will not be noticeable in the early period when swelling obscures them. As the swelling subsides, usually within four to six weeks, they become more obvious. If you have exisiting cellulite or other skin irregularities before the procedure, your skin texture will not improve by having liposuction. The doctor can only remove the fatty bulges, but the ultimate result depends on individual healing potential and being on a sensible diet. Wearing the correct corset and clothing afterwards plus regular massage, will help to ensure a smoother result. Bruising is common with liposuction surgery and usually disappears by two to three weeks. Swelling is also common with the “tumescent” technique we use, subsiding within the first week. By 4-6 weeks you will have a more realistic idea of the final result. How long do I wear the support garment? It should be worn night and day the first two weeks, although it can be removed for showers. Then, you should wear it 12 hours a day, for two to four weeks. Tight clothing like jeans or underpants (that are tight in the waist) should not be worn for one month, as they will leave a demarcation line when the loose skin redrapes itself. Some patients go to work the following day, although the area where the liposuction occured is very tender. Pain is very individual, and depends upon the area operated. Three to four days off work would be ideal, but not compulsory, after a liposuction procedure. Will the skin be flabby? Skin is usually very elastic, but this is individual. Once the fat layer is removed, skin sticks better to the muscle and usually shrinks back very well. The proper elastic support garments also help and are very important, along with continuing massage to ensure a smooth liposuction result. Can I drive home after my liposuction surgery? No, because you have been given light sedation. You cannot catch public transport or drive till the following day. Please arrange for someone responsible to pick you up.